Hey there! Thanks for dropping by gajendrak! Take a look around and grab the RSS feed to stay updated. See you around! How to read data from scratched/damaged drives eg. CD/DVD ? 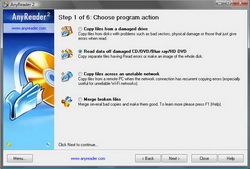 Effectively copies corrupt data from any type of disks or erroneous connections if standard copying methods fail. AnyReader supports resumed downloads from the remote PC if the connection was broken during the copy process (especially useful for unreliable Wi-Fi networks). 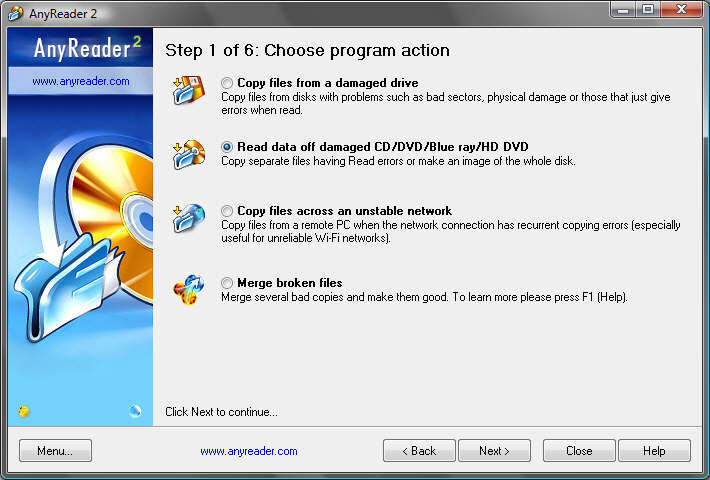 AnyReader is great for copying files from scratched CD/DVD/Blu-ray or defective floppy/hard disks. Normally when your computer is unable to copy files from a damaged disk it will abort and delete the part of the file it has copied. AnyReader will continue copying the file right to the end; any data that hasn’t been recovered after several retries is replaced with blanks. This will allow you to effectively read every byte of information that can be read at all. Note: Using AnyReader is safe and risk-free. The software does not write data to your original disks, but saves the recovered data to a new folder that you specify. – Reads files from disks with physical damage. – Allows you to copy files from disks with problems such as bad sectors, scratches or that just give errors when reading data. – Reads data as much as possible. – Reads data from the erroneous network connections. It supports resumed downloads from the remote PC if connection was broken during the copy process. – Support file sizes up to file system limits. – Easy to use, intuitive wizard-driven interface. – Supports all modern Windows versions, including Windows® NT/2000/XP/2003/Vista. Selecting the files to be copied. Selecting the target folder and adjusting the task options. * Click on the images above to enlarge. How to speed up/run faster Windows/PC? How to delete/uninstall a Linux/ubuntu partition safely from dual boot?